I'm not a particularly loud dresser. I mean, I strive to look put together but I'm not pushing any boundaries or breaking new ground over here. Most of my outfits don't merit a second glance from passers-by. But this one? There was this guy at Wal Mart who did a triple take, raised an eyebrow, then shrugged as if he just could not understand what was going on over here. It was kind of funny given the source (total People of Wal Mart candidate). But seriously. This outfit was shrugged. Whatever. My mom liked it. ANYWAY. How did you fare? Let's see it! Don't forget to go visit the lovely ladies over in the Flickr group as well! Well, you just can't judge an outfit by a guy at Walmart. 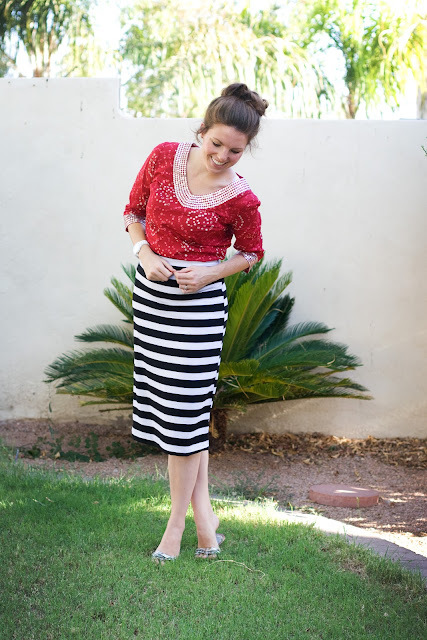 :) I love the striped with the pop of red! Beautiful! Super cute! I have the same top and am now inspired to try wearing it with something other than jeans. I really love this outfit! The silhouette and colors are so nice. Stupid Walmart guy. I LOVE your outfit- genius with that St. Barth tunic! Forget his shrug. I love it! I will forever covet that skirt. Am always praying I will find fabric in that print/stretch/etc. I'm loving it. I've been off kilter by the pattern mixing fervor going on amongst the blogs I read, and I'm still trying to work myself up to it! It's definitely helping to see all the evidence of cute paired patterns! Maybe he couldn't believe someone so stylish was in there. What a great skirt! :) Good job! Love the outfit and jelous of how your whisps perfectly fall into place. We were on the same wavelength with our striped skirts! I love it! It's not a loud outfit so much as an assertive one. :) Ooh, have you seen the People of Walmart website? Sooo funny. I doubt you'd ever be put on that site, you are much too put together! Maybe us fashion bloggers are more used to this type of outfits, because I don't think this is loud at all! I think it looks great! Oooh, I love the print on that top! i was so bummed i pretty much missed this one so i put one up from like 5 days ago? that might be too long ago so you can delete if you like but this is my fave challenge so far. i LOVE mixing prints!